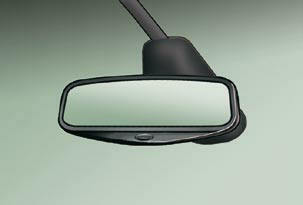 Each fi tted with an adjustable mirror glass permitting the lateral rearward vision necessary for overtaking or parking. They can also be folded for parking in confi ned spaces. If your vehicle is fi tted with heated mirrors, the demisting-defrosting is effected with the engine running, by switching on the heated rear screen (refer to the "Demisting-defrosting the rear screen" section). Move control A to the right or to the left to select the corresponding mirror. Move control B in all four directions to adjust. Return control A to the central position. The objects observed are, in reality, closer than they appear. Take this into account in order to correctly judge the distance of vehicles approaching from behind. From outside: lock the vehicle using the remote control or the key. From inside: with the ignition on, pull control A rearwards. If the mirrors are folded using control A , they will not unfold when the vehicle is unlocked. Pull again on control A . 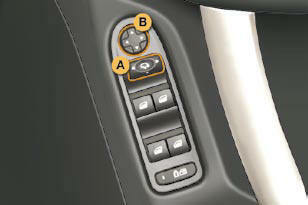 From outside: unlock the vehicle using the remote control or the key. 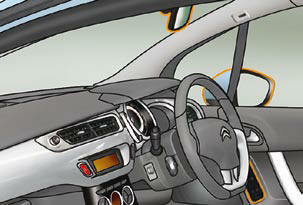 The folding and unfolding of the exterior mirrors using the remote control can be deactivated by a CITROËN dealer. Adjustable mirror providing a central rearward view. The mirror is fi tted with a night-time anti-dazzle device. Adjust the mirror so that the glass is directed correctly in the "day" position. Pull the lever to change to the "night" anti-dazzle position. Push the lever to change to the normal "day" position. 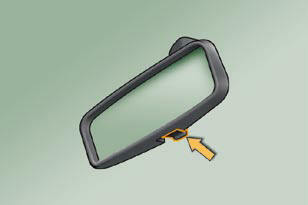 As a safety precaution, the mirrors must be adjusted to reduce the "blind spot". System which automatically and progressively changes between the day and night uses. In order to prevent dazzle, the interior mirror glass darkens automatically in relation to the intensity of the light from the rear. It lightens when the light (light beam of following vehicles, sun...) decreases, so guaranteeing optimum visibility. In order to guarantee optimum visibility during your manoeuvres, the mirror lightens automatically when reverse gear is engaged.